Microflex ensures your personal comfort and your protection from snow, wind and rain. Lyngsoe LR13-05 Microflex Hi Vis Orange Coverall fabric: 50% polyamide, 50% polyurethane, 170 g/m². Lyngsoe LR13-05 Microflex Hi Vis Orange Coverall conforms to: EN11416, EN1149 and EN343 safety standards. Microflex hi visibility flame retardant coverall. Lyngsoe FR-LR13-05 HI VIS Orange Coverall Fabric: 50% polyamide, 50% polyurethane, 210g/m2. 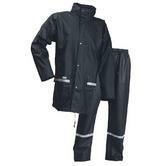 Microflex coverall suitable for work environment subjet to flames exposure hazards. Lyngsoe FR-LR13-05 Microflex HI VIS Orange Coverall conforms to: EN11416, EN1149, EN343 standards. This coverall is made from tough , durable Microflex which ensures your personal comfort and your protection from snow, wind and rain. Waterproof up to 8000mm, which is excellent depth water resistance. Lyngsoe HI VIS Orange Coverall Microflex Flame Retardant LR57-05 complies to EN471, EN14116 and EN1149 safety standards. Elasticated shoulder straps with buckles, high-frequency welded seams, press stud adjustments by the ankles, 3M reflective tape. These anti-static, flame retardant bib & brace trousers will keep you safe, and seen. Lining: FR cotton quilted lining with polyester filling. Lyngsoe FR Hi Vis Bib & Brace Lined Trousers FR-LR546 conforms to: EN20471 class 2, EN11416, EN1149, EN343 safety standards. 3M reflective tape for more visibility. Lining: 50% Polyamide, 25% Polyurethane, 25% Pvc . Lyngsoe Flame Retardant & Anti-Static Hi Vis Bib & Brace Trousers Lined conforms to: EN20471 class 2, EN14116, EN1149, EN343 safety standards. Elasticated shoulder straps with buckles, high-frequency welded seams. With press stud adjustments by the ankles & 3M reflective tape. Lyngsoe FR & Anti-Static Hi Vis Bib & Brace conforms to: EN 14116 EN 1149-5 EN 20471 Class 3 EN 343 Class 3:1 safety standards. Microflex FR with stretch technology. Flame retardant rain trousers with elastic waist. Press stud adjustments by the ankles. Material: 50% Polyamide, 50% Polyurethane, 170 g/m². Lyngsoe FR-LR52 Flame Retardant Hi Vis Trousers conforms to: EN343 2003 +A1:2007, EN471 2003 +A1:2007, EN ISO 14116:2008 INDEX 1, EN1149-5:2008, EN1149-3:2004. Lyngsoe Rainwear Microflex Flame Retardant Trousers. Elasticated waist, High-Frequency welded seams, press stud adjustments by the ankles. Lyngsoe Microflex Trousers HI VIS Orange Waist Flex Branded LR41-05. Microflex fabric ensures your personal comfort and your protection from wind and rain. All seams are sealed by high frequency welding to ensure no water penetration. Material: 50% Polyamide 50% Polyurethane, 170g/m². Lyngsoe LR41 Men Work Trousers conforms to: EN 343 2003+A1 2007 3:1 Water Penetration Resistance standard. Lyngsoe LR41 waterproof trousers are made from tough microflex material. Pull on trousers with elasticated waist suitable for different size waists. All garment seams are sealed by HF welding to ensure no water penetration. Weatherproof against rain, wind and cold making these a good all weather pair of trousers. Classification 3 for water penetration and 1 for water vapour resistance. Press stud adjustments by the ankles for adaptability. Made from 50% Polyester, 50% Polyurethan, 190 g/m 2 (Hi-Viz: 210 g/m2) materials. Lyngsoe LR41-56 Work Trousers conforms to: EN11416, EN1149, EN343 safety standards. 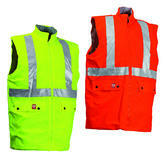 Lyngsoe Microflex flame retardant Hi-Viz bodywarmer. Strong, high frequency welded seams together with a quilted lining make this a durable, yet comfortable wear. Weatherproof body warmer with High frequency welded seams. Comfortable bodywarmer FR Quilted Cotton lining with Polyester Padding. 2 patch pockets and 1 inside pocket. 3M reflective tape adding more visibility for your workplace. Material: 50% Polyamide, 50% Polyurethane, 210 g./m2. Lining: 100% Nylon with Polyester padding. Lyngsoe FR-LR1456 Lined Bodywarmer conforms to EN20471 Class-3, EN14116 and EN1149-5 safety standards. Mens softshell fleece jacket with hood front zip. Keep warm and dry in this wind-proof, waterproof, breathable jacket by Lyngsoe. Features include neck zip-cover & Velcro adjustable sleeves. Lyngsoe Fox 100 Fleece Softshell Jacket is made using 44% Polyester, 6% Spandex, 50% Polyamide coating meterial and 100% Fleece lining. 3 Outside pockets, 2 inside pocket. Zip cover at the neck. Flame retardant waterproof jacket. Strong, flexible microflex jacket with fixed hood with drawstring, zipper and press stud fastening. Adjustable press stud on sleeves and two patch pockets. Waterproof, Antistatic and Flame Retardant Jacket materials: 50% polyamide, 50% polyurethane, 170-190 gsm. Lyngsoe FR LR48-05 Waterproof Flame Retardant Jacket conforms to: EN11416, EN1149, EN343 safety standards. 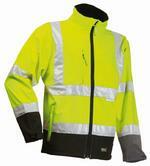 Lyngsoe Fox 471 Microflex Hi Vis Softshell Jacket with adjustable sleeves and elasticated waist. Windproof and waterproof, breathable Microflex Hi-Visibility Softshell Jacket keeps you warm, dry, and visible. Elasticated adjustments at waist, Sleeves with strap adjustments. Waterproof: 8.000 mm / Breathability: 2.000 Mvp. Microflex Hi-Visibility Softshell Jacket material: 44% Polyester, 6% Spandex, 50% Polyamide coating. Lyngsoe FOX471 Microflex Hi Vis Rain Jacket conforms to: EN 20471 Class 3 and EN 343 Class 3:2 Safety Standards. Men's jacket with detachable hood. Keep warm and dry in this wind-proof, waterproof and breathable jacket by Lyngsoe. Features include Velcro adjustable cuffs with elastic wind cuffs with thumbhole for extra strength. Two large pockets in front with zipper. 1 breastpocket. Printed reflection on pockets, shoulder, sleeves and back. Fleece lining in around the neck for higher comfort. Double storm flap with velcro. 2 inside pockets with details and a pocket for mobile phone including loops for headphone wire. The Lyngsoe Microflex FRLR3567 is a flame retardant and waterproof with High frequency welded seams. The Lyngsoe Microflex FRLR3567 is a Flame Retardant, Waterproof, Antistatic, high visibility bomber rain jacket with reflective tape. Material: 50% Polyamide, 50% Polyurethane, 170 g.m2. Lyngsoe FR-LR3567 Flame Retardant Bomber Jacket conforms to En 343 (wetwear), EN 471 (hi viz) , En 14116 (FR) & En 1149 (antistatic) standards. Conclusion: Lyngsoe Microflex gives you up to 200% stretchability witin its breathable waterproof outer coating. This is (another) highly functional, technical product from Scandinavia, at a reasonable price. Antistatic, high visibility Rain Jacket with multiple pockets (Phone pocket - ID pocket - 3 outside pockets - 3 inside pockets), elasticated waist and adjustable sleeves with velcro. 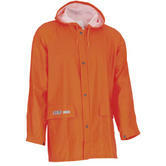 Practical raincoat in a bright orange colour to improve your visibility in the workplace. Protection against rain, wind and cold. Adjustable wrist widths by press studs. Fabric: 50% Polyamide 50% Polyurethane 170g/m² . Lyngsoe LR48-05 Orange Waterproof Jacket conforms to: CE CAT II, EN 343 3:1. Lyngsoe Rainwear: FR waterproof rainwear made with Microflex PU material. Danish Lyngsoe Rainwear is one of the largest rainwear producers in Europe. Lyngsoe has an outstanding range of premium Flame Resistant, Waterproof, Windproof and Breathable garments, made in both Europe and Asia. The stretchable, breathable waterproof PU material used in most Lyngsoe products means that they are ergonomic and comfortable, while protecting you from water, wind and flame. When you buy Lyngsoe garments, you are getting the best in FR, windproof, waterproof and breathable products. Lyngsoe FOX 200 soft shell jacket. This is a stylish, water-resistant softshell jacket, with an adjustable and detachable hood, multiple pockets and Velcro adjustable sleeves. Lyngsoe FOX 471. The Fox 471 is Hi vis - it will keep you well-protected from the winter elements, ensuring your comfort and safety in poor visibility conditions. Lyngsoe Hi Vis Winter Coverall LR33- Waterproof, thermal quilted lining, and hi-viz. This is a high quality coverall designed for both function and comfort. Available with or/ without FR protection. Lyngsoe FR Bib and brace trousers These orange, FR, waterproof, breathable PU bib and Brace trousers are our most popular. They are used across North Sea rigs and shipping vessels. This Lyngsoe orange PU unlined Jacket Can also be worn with the bib and brace trousers. Lyngsoe FR lined PU jacket These two tone waterproof FR jackets are lined and very comfortable - hence their great popularity. Microflex is a Lyngsoe subbrand - relating to the Polyurethane (PU) material used on all the waterproof garments. PU is a soft, highly stretchable, noiseless, breathable waterproof material. Lyngsoe has their Microflex brand of PU - other manufacturers such as Sioen have their Flexothane brand of PU: They are all variations on the breathable, waterproof, stretchable PU material.